The Corner Shoppe in Gilbertsville, Pennsylvania, carries a large inventory of country gifts and collectibles, handmade right here in America. The Corner Shop strongly believes in supporting our country’s economy by purchasing American-made products whenever possible. The Corner Shoppe helps provide an opportunity for artists to display their unique talents. The shop represents many local artisans who make braided wool baskets, craft hand blown glass pendants and ornaments, carve wooden bowls, sew beautiful, originally designed clothes for the American Girl Doll, knit baby outfits and dishcloths, paint designs on wine glasses, make red ware bowls and plates and many more. Whenever possible, each piece has a tag describing the artist and the process he or she uses to create the piece. 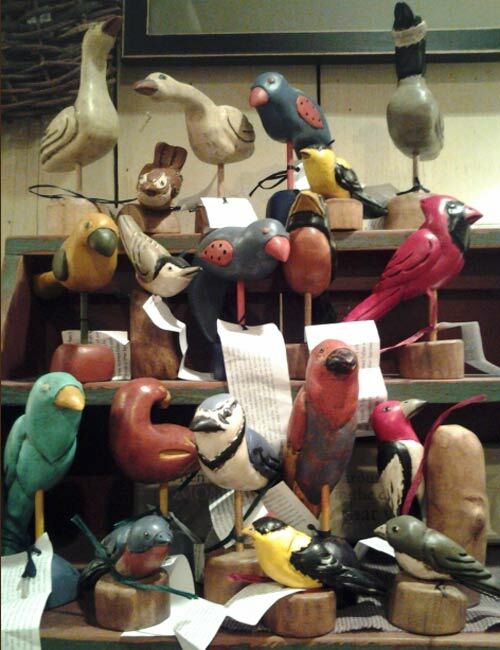 This artist carves and paints birds and seasonal figurines such as Santas, pumpkins, and bunnies out of wood. The artist used felled or recycled wood to make all of the pedestals for the birds. 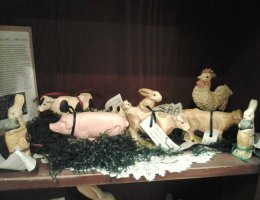 This Pennsylvania artisan uses antique German chocolate molds from the late 1800s and early 1900s to create whimsical chalk ware figurines. Each bunny, farm animal, snowman and Santa is carefully and lovingly painted. Chosen to be part of the White House Christmas display by Nancy Reagan, these charming figurines were also collected by Jackie Onassis and make great one-of-a-kind gifts. Visit The Corner Shoppe in Gilbertsville, Pennsylvania, or call 610-367-6884 today to see our country gifts and collectibles in person or for additional information.